EST Eisenbahn-Systemtechnik GmbH is a company that specializes in crashworthy rail vehicles. EST consults with customers from the rail vehicle industry in the development of new vehicles. Besides the area of crashworthiness (passive safety) EST has ample knowledge from long-term experience in static and dynamic structural mechanics, structural integrity, weld design, production cost optimization, design for error-tolerance and strategic development planning. On customer demand, EST can take over entire development tasks and execute them just as efficiently as competently. For individual components that can fulfill technical requirements with clearly defined interfaces, EST develops ready-to-use components, which the manufacturers and the operators of rail vehicles can apply with ease. 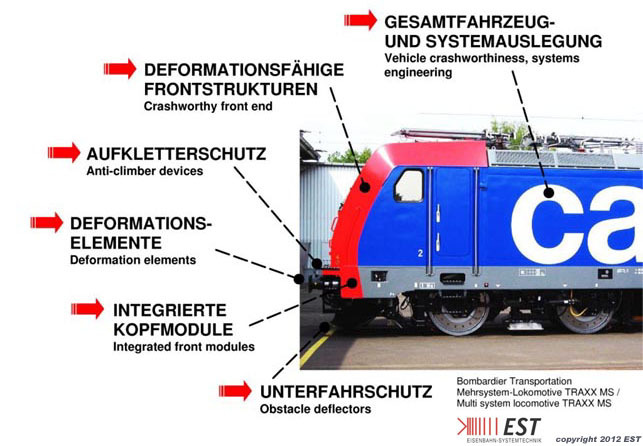 The EST Crash Buffer is a good example for such a component, which was invented by EST, developed for series production and approved by the Federal German railway approval authority Eisenbahn-Bundesamt (EBA). In 2006, EST was honoured with the Innovation Award of the State of Baden-Württemberg (Dr.-Rudolf-Eberle-Preis) for this Crash Buffer. ...Wascosa "Safe Tank Car ®"
Disclaimer: Information in this webpage and its subpages may contain errors or inaccuracies. This webpage and its subpages contain links to other sites. EST is not responsible for the contents of these other sites and does not associate with the contents of these other sites. All data as at time of publication and according to conducted tests. EST reserves the right to make changes at any time, without notice, in products and specifications. Our products are designed to reduce damages in collision events. Real collisions are subject to vehicle parameters and external influences. EST does not assume liability that damage reduction or prevention are always fully reached. Copyright: The pictures and information contained in this webpage and its sub-pages have been published for online access in the World Wide Web, all rights (Copyright), though, remain with the authors/editors. Reproduction or use of the images and text material, especially their commercial use, is permitted only when agreed by the author/editor. Last update: 18 December 2018. Replaces all previous versions.